The team at Trunk doors have been making made to measure doors for over 20 years, we have the range and capabilities to deliver any desired style. With every bespoke door order, we offer a truly bespoke handcrafted product made from the highest quality materials, delivered by our master craftsmen. 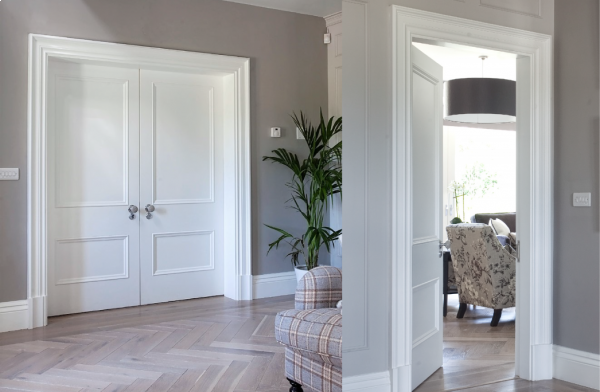 Often overlooked, internal doors play an integral part of how a space functions as well as adding to the architectural style. Specialising in interior doors, interior rated fire doors and exteriors doors we can build the most odd shaped and sized doors. No order is too big, or too small. Choosing the right door is important, at trunk we understand this as they can complement the design, flow and atmosphere of a space. Our handpicked range of designer interior doors includes a range of 1,2,3,4,6, and glass doors. They can be found in our product category. They are all available in a range of our custom mouldings and beadings. These products offer a variable amount of internal door mouldings. These mouldings have been designed with care and made with the highest craftsmanship in the Trunk workshop. They include modern, contemprary and traditional styles, We also offer a bespoke moulding service whereby we can match any bespoke moulding design.